This title was first published in 2003.During the 1990s research and technological development policies moved from a 'problem-solving' approach towards a wider one focusing on the systemic nature of the innovation process. This change can be featured as the transition from a technology policy towards an innovation policy. 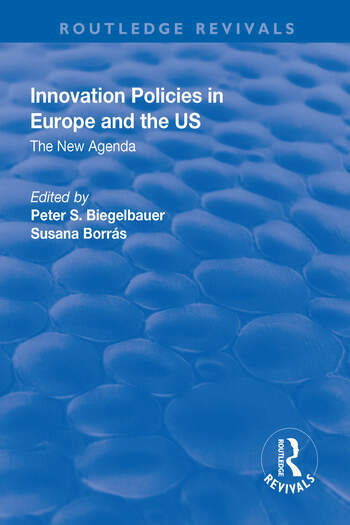 'Innovation Policies in Europe and the US: The New Agenda' provides a comparative analysis of eleven highly industrialized countries’ innovation policies in the 1990s, and addresses the nature, dynamics, causes and effects of this transition. By combining the analytical skills of sociologists, economists and political scientists the book sets up a novel framework for studying the evolution of this particular policy area by examining institutional change from a broader perspective. Contents: Introduction: ideas and the transition from technology to innovation policy; The UK experiment - science, technology and industrial policy in Britain 1979-2000, Margaret Sharp; Public venture capital: the secret life of US science policy, Henry Etzkowitz; On the French system of innovation: between institutional inertia and rapid changes, Dominique Foray; Innovation policy in Finland, Tarmo Lemola; Changes in Danish innovation policy - responses to the challenges of a dynamic business environment, Jesper Lindgaard Christensen; Technology policy learning in The Netherlands 1979-1997, Marianne van der Steen; The internationalization of science and technology policy: Malta case study 1988-1996, Jennifer Cassingena Harper; Running after the international trend: Keynesian power balances and the sustainable repulsion of the innovation paradigm in Austria, Kurt Mayer; Evolution and revolution in policy-making: Hungarian industry, science and technology policy-making, Peter S. Biegelbauer; Socio-economic transition and new challenges for the science and technology policy in Slovenia, Franc Mali; The Italian system of innovation: the gradual transition from a weak ’mission-oriented’ system to a regionalized learning system, Fiorenza Belussi; How do economic ideas become relevant in RTD policy-making? lessons from a European case study, Jakob Edler; Conclusion: policy changes, actors, institutions and learning; List of authors; Index.